Touch the screen and a note is generated. It's X-Axis (left-to-right) is pitch, which is designated by note and octave markings. It's Y-Axis (up-and-down) is up to you to control! Plasma Sound is incredibly configurable. Pick the note range, the waveform, cutoff, delay, tremolo, vibrato and more! You can even select between continuous mode (theremin-like), quantize mode (keyboard-like), or a hybrid. 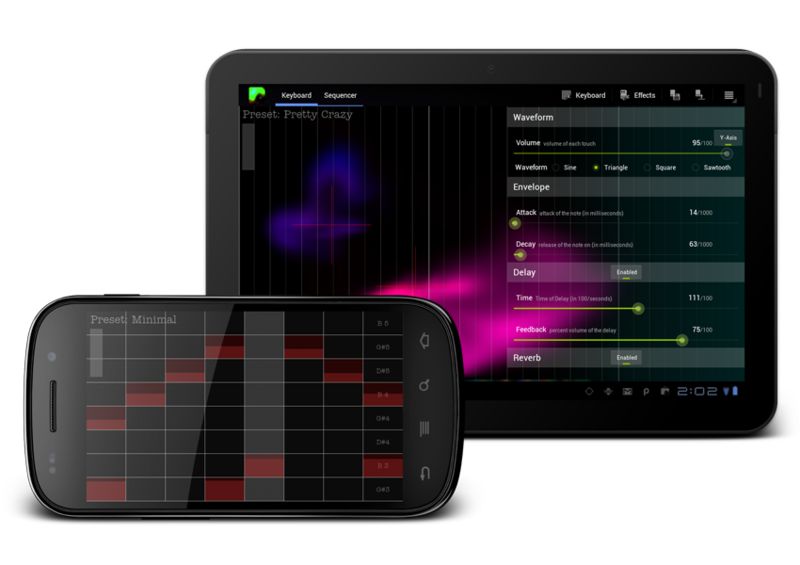 Plasma Sound applies the same principals to the Sequencer to give you even more music creation abilities! Select a note to activate it, and drag up and down to select it's Y-value, controlling the same thing that the Y-Axis controls in the Keyboard section. Immediately you get an incredibly dynamic and versatile sequencer. Coolest music like piano app so far. I would think somebody who knows music could use it to make sweet synth or 16bit/ 8-bit chiptune like music and HDMI it out to a projector big screen at a club if you was a dj or something. The plasma mist smoke looks a bit blocky and low res on my Xoom tablet screen and large screens though like a ps1 fog effect. some strange graphic bugs too looks like a glitchy NES game sometimes with things showing up that look like they should not be there. Suggestions, questions, or other feedback?